Have you ever had a great cup of coffee in Paris? If you haven’t visited the city in the last seven years or so, your last cup of caoua [ka wa] here was probably burned, bitter “sock juice,” a purely utilitarian beverage found in any number of the average-to-poor cafés around the city. No longer! The “third wave” of coffee has arrived on Parisian shores. For years, I just accepted the sorry state of coffee in Paris: I’d go into a café, order my breuvage, and expect to spend the next half-hour or so lingering over the coffee and ruminating my morning thoughts in a public place. (Well, this really means I was just staring into space while waiting for the caffeine to kick in). Other sleepy customers would push open the café’s glass door and let in the green-smelling gust coming off the beautiful square Gardette in the 11th, one of my favorite spots in eastern Paris. There I’d sit, wondering how long could I make one tiny cup of coffee last while I reflected on the day ahead, or on the meaning of the dream that woke me so suddenly this morning. Like most Parisians, I was in denial. I didn’t want to admit that any food or drink specialty could be less than gourmet in our fair city. But coffee, until recently, was indeed just a wake-me-up, to be ordered with as little water as possible (called a café serré, which I mentioned in a previous post), and drunk, summarily, before the onslaught of the day’s tasks. But with the arrival of the so-called third wave movement in coffee consumption, a reference to buying and drinking Good Coffee (in Paris), Parisians are finally starting to realize that coffee, like a fine wine, deserves just as much care in selection and preparation as any other gourmet food or beverage. In the United States, specialty coffee has already gone mainstream. In 2014, according to an article and the Specialty Coffee Association of America, over half of all coffee consumed in the U.S. was specialty coffee. That’s because even chain restaurants are cashing in on the trend, and they’re also offering alternative additions like coconut or almond milk. But what is specialty coffee? What is this “third wave” all about? Most of the commercial coffee we drink is a blend of coffee beans produced in many different countries. If you visit one of Paris’ best sources for tasty coffee, La Caféothèque, you’ll find beans from over 50 countries. But they’re never blended together, so drinking a single-origin coffee is like drinking a single-varietal wine (like Pinot noir) instead of a mish-mash of different kinds of grapes in the same bottle. Gloria Montenegro, the owner of La Caféothèque, distinguishes between industrial coffee, the kind you find in most Parisian cafés, and cafés fins, or what we call specialty coffees. In the video below, you can hear Gloria Montenegro, and quite a few other third wave café owners in Paris (Coutume, Lomi, Loustic, l’Arbre à Café, KB), talk a little about the coffees they sell, including the fact that like wine, coffee is a product of the terroir, roughly meaning the land and climate in which they’re grown. One thing in particular that I like about La Caféothèque is that you’ll find a little box in the back of the conference room – the very same one you’ll find in wine schools – with tiny numbered vials. Each vial, when opened, contains the essence of rose, potato, oak, or any number of various essences. Since you have to guess what you’re smelling, they help you train your nose to recognize different aromas. It’s not as easy as it sounds! At La Caféothèque, you’ll even find a “tasting protocol” that looks like the one you’d use for tasting wine. The professional act of tasting coffee is called cupping, and allows a coffee buyer, for example, to evaluate a coffee’s aroma and other qualities. You’ve probably guessed by now that coffee’s third wave involves highly passionate people, who are usually trained as baristas (basically coffee sommeliers – there’s that wine comparison again!). They know how to make latte art, they buy coffee from small producers through direct trade methods, and they know how to prepare coffee in every type of device imaginable: the French press (strangely known not as "French press" in French but as a cafetière à piston), the V60, or even a beautiful and well-maintained espresso machine. Far from being a hipster fad, as mocked in this video, good coffee is finally a real movement in Paris. As Gloria Montenegro says, “When coffee is good, we drink it with pleasure, and when it’s not good, we drink it anyway, because it wakes us up.” So even though it took Parisians years to wake up and smell the coffee, as it were, you can finally find a respectable cup of joe in the City of Light! For a recent article (in French) on the coffee revolution in Paris, click here. And for an excellent and thorough article on what the different "waves" in coffee mean, please click here to read Daily Cupo’s article! 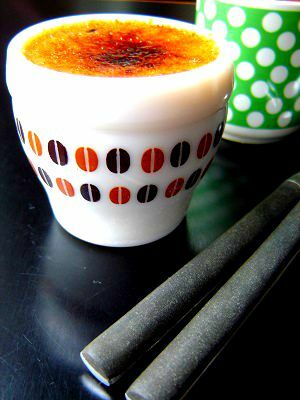 This is not a standard crème brûlée recipe, but an ultra-rich fine-dining restaurant recipe that we used when I worked with the one-Michelin-starred chef Gérard Bossé in the Loire Valley. A high proportion of egg yolks to other ingredients means a richer custard – perfect for a luxurious finish to a “gastronomic” meal. But even if the meal you served isn’t of gourmet calibre, no worries – this way of ending the meal will leave your guests happy and fulfilled. The success of this recipe depends on two factors: first, maturing the mix, which simply means putting the raw ingredients together a day or two before you want to serve the custards. Second, after cooking and cooling, the custards should be refrigerated a full night so they set and are perfectly cold. What makes a perfect crème brûlée is the contrast in textures and temperatures between the very cold, smooth cream lying underneath the hot burnt crispy sugar. I prefer to make crème brûlée in small ramekins, not the wide shallow ones found everywhere, because when you torch the sugar in shallow ramekins it tends to heat up the custard underneath. But then again, lots of chefs have discussed the importance of custard-to-caramel ratio, which some seem to like better in the shallow dishes. Do as you like, of course! But you’ll have to adjust the cooking time (less for shallow dishes). 1. A day or two before you want to eat the custards, make the mix. Begin by heating the milk and cream together in a small saucepan over medium heat. 2. When they have reached a boil, turn off the heat, and add the ground coffee. Whisk well and cover the pan. 3. Let the coffee infuse the milk and cream for about ten minutes, then pour through a very fine-meshed strainer. Let the milk and cream cool completely. 4. In a medium bowl, whisk together vigorously the egg yolks and the sugar for about three minutes, making sure to push stray sugar grains down from the sides of the bowl. 5. Add in the strained coffee-infused milk and cream, and whisk thoroughly. 6. Cover tightly and leave to mature in the fridge overnight. 7. Preheat the oven to 300° F (150° C). 8. Making sure to have hot water at the ready, fill your ramekins or cups to the top rim, and place them in a baking pan with at least 2-inch sides, staggering them so the water will be able to circulate freely and heat the cups evenly. To avoid spillage, I usually set the pan with the ramekins in the oven before pouring in the water to about three-fourths of the way up the sides. 9. Cook in the oven for anywhere from 30 minutes to 1 hour, depending on your ramekin depth, or until the custards still jiggle just a little in the center. 10. Remove from the oven, let cool, and refrigerate overnight. 11. Just before serving, sprinkle the tops of the creams with the sugar, and torch the tops using a small kitchen blowtorch, working in a slow, back-and-forth motion to caramelize the sugar. 12. Serve immediately. Enjoy the smooth richness… Régalez-vous !